Anyone who goes hunting will tell you that the blade is the most important part of any knife. Since you will be cutting into pelts and that type of thing, you need something that is very sharp and sturdy. This knife is fitted with a leaf blade that is a modified version of the basic straight edge knife. There is a slight curve that will help you distinguish the two. 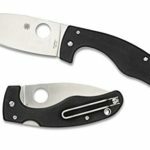 There is a thumb hole in the blade that allows the knife to be opened easily without incident. The mirrored finish is virtually rustproof and is very easy to keep clean. The Spyderco Delica has a slightly smaller blade compared to its counterpart, the Endura but that doesn’t mean it still can’t handle its fair share of work! In fact, as the name suggests, the Delica is really good at dealing with smaller “delicate” tasks which require the touch of a smaller blade. Furthermore, thanks to the shape of the blade, it handles piercing tasks quite surprisingly well. 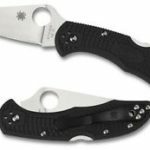 Furthermore, unlike the Endura, the Delica features a partially serrated edge allowing it to make quick work of thicker materials. 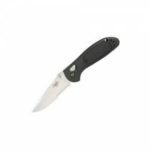 The blade is made out of high-quality VG-10 steel which allows it to keep a nice sharp edge meaning you don’t have to waste all of your time sharpening it. You may have to use a fine stone or a strop to hone it on a regular basis. There is a very high amount of carbon in the blade, which explains it is very resistant to normal wear. In fact, when using a stone to sharpen the knife you may notice that the blade does not get scratched very much by the stone. Putting a little extra pressure should give you the results you are looking for. However, like the Endura, you will find that you will need to sharpen it probably a bit more often than you would have liked to. Other than that, the Delica has a really solid blade which I am sure you will definitely be impressed with, I know I was! As you can tell from those figures, this is a very thin knife that can easily slip in one of your pockets with no problem. One of the Delica’s best features, in my opinion, is its handle. This bad boy fits like a glove so to speak and will ensure that you always have a non-slip tight grip on it. The design of the handle curves to the shape of your palm making it extremely comfortable to hold, even when under heavy pressure or weight. Like the Endura, the new Delica4 features a screw design which allows you to easily open the knife in order to give it a clean or a bit of a touch up (if you ever need to). 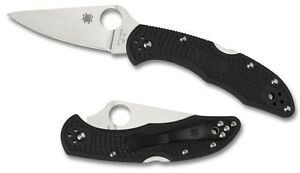 Coupled along with the fact that this knife can be opened incredibly easily and smoothly with one hand makes the Spyderco Delica one hell of an every day carry knife. This knife is made of fiberglass, which means that it feels comfortable against the hand as you cut. You should wear gloves when using this knife since the thumb hole is a bit sharp. The handle is textured, so there is no need for you to worry about slippage while you are using it. There is a clip made onto the knife so you can place it in your pocket for those times when you do not have any free hands. The handle comes in five different colors; blue, brown, green, gray and purple. If you are one of those people that are extremely concerned with aesthetics, this should be a huge bonus. 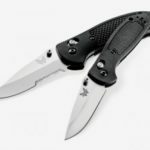 There is a limited warranty offered when you purchase the knife, in case there was something wrong with the way it was manufactured, or you encounter some other issue. As you can probably tell, this is one knife that is very popular among hunters. The product’s design and features make it very appealing to hunters all over the place. 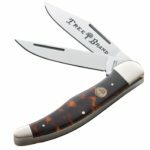 If you are an avid hunter or you are just getting started, it is very important for you to have a good quality knife on hand. You should definitely consider purchasing this one. 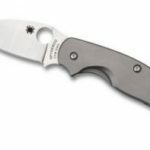 Overall, if you are looking for a lightweight, extremely versatile whilst at the same time comfortable every day carry knife then you really need to check out the Spyderco Delica. The best thing about this is that it is really affordable, whilst not being so cheap that they had to succumb to cheap parts. 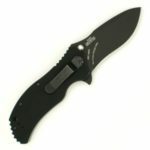 So for around $60, you are getting yourself a really top notch quality every day carry knife. 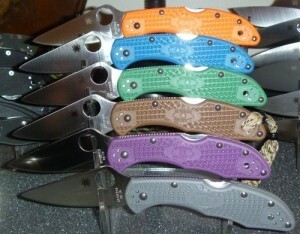 Better yet, this knife comes in a variety of colors so I am sure that you will be able to find one that suits you.